OMG Posters! » Archive "The Lost Boys" Poster by James Rheem Davis - OMG Posters! 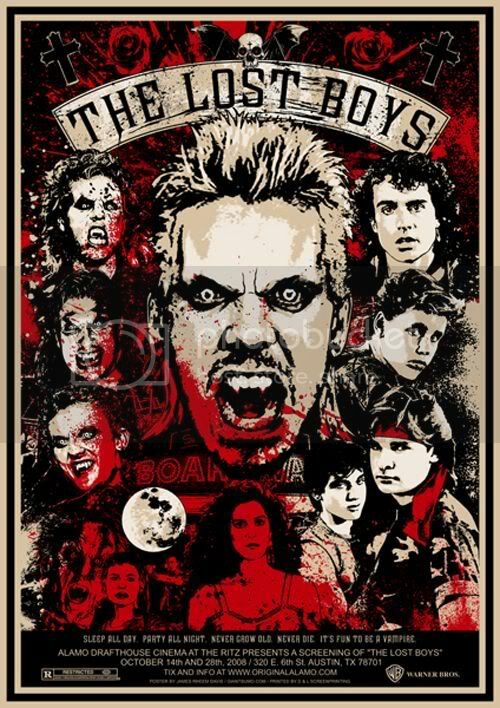 The Alamo Drafthouse decided to have a second Lost Boys poster done by James Rheem Davis for a new showing. This one is a 24″ x 34″ screenprint, and costs $30. You can pick one up now at Mondotees.com. Looks awesome. Better than the Stout one IMO. Disagree, Stouts is way better. I’m not sure how this one looks in person, but by the image the print seems to be very pixelated. Also, Stouts has a bunch of hidden gems in it that u have to look for. Concerning the pixelation, this is a preview jpg. I can guarantee the printed version won’t glow like a monitor screen, either. is this amazing poster still avalible ?? and do u ship to sweden ?